Aspirin protect 100 mg 42 pcs. Aspirin Protect 100 mg 98 pcs. Aspirin Protect 300 mg 98 pcs. Aspirin Plus C effervescent tablet 10 pcs. Aspirin Plus C effervescent tablet 20 pcs. Aspirin Plus C effervescent tablet 40 pcs. 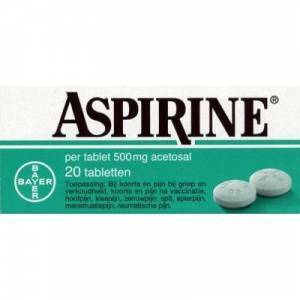 Aspirin Migräne 500 mg 12 pcs. Aspirin 500 mg 20 coated tabl. Aspirin Migräne 500 mg 24 pcs. Aspirin 500 mg 40 coated tabl. Aspirin 500 mg 80 coated tabl. Aspirin is an anti-inflammatory painkiller (NSAID) that contains the active ingredient acetylsalicylic acid, also referred to as acetosal. Aspirin works by blocking the transmission of pain signals, inhibiting them from reaching the brain. In addition, aspirin reduces fever and suppresses inflammatory responses such as swelling and redness of the skin. Toothache or pain after dental surgery. Aspirin should be swallowed whole with plenty of liquid. You can also dissolve the tablet in water first. Effervescent tablets should always be dissolved in water before administration. This medicine is most effective when taken on an empty stomach. If you have a sensitive stomach, it is best to take it with or after meals to avoid stomach distress. Aspirin is sold over the counter in various strengths. Read the package leaflet before use. Children aged 3 to 12: one to three 100-mg tablets a day, depending on age (see package leaflet). Always check with your doctor before giving your child aspirin. Blood thinning, causing cuts to bleed longer. See package leaflet for a complete list of side effects. You are allergic to acetylsalicylic acid (acetosal), or any other ingredient in aspirin. Your child has chicken pox or the flu as this increases the risk of developing serious side effects. Aspirin interacts with other medicines, including blood pressure reducers and anticoagulants. The doctor will have a list of medicines that you should avoid mixing it with. Make sure to mention what other medicines you are taking during the online consultation. See package leaflet for more information about contraindications. Aspirin should only be used with your doctor's approval if you are pregnant or breastfeeding. Do not take it during the last three months of pregnancy. Aspirin may cause dizziness. Use caution when driving or performing tasks requiring alertness. Mixing alcohol and aspirin may cause or worsen stomach problems. It is therefore advisable to reduce or stop alcohol consumption while taking this painkiller.